Linux operating systems run on the kernel actually Linux kernel. The kernel name is Linux but the distributions are generally named as Linux. Kernel provides operating system services to the user space applications. Kernel have a lot of option and configurations possibilities to meet user space applications, libraries and system administrator needs. These configurations may be IP stack, disk read limit, loaded modules etc. There are different ways to manage this configuration variables or kernel parameters. 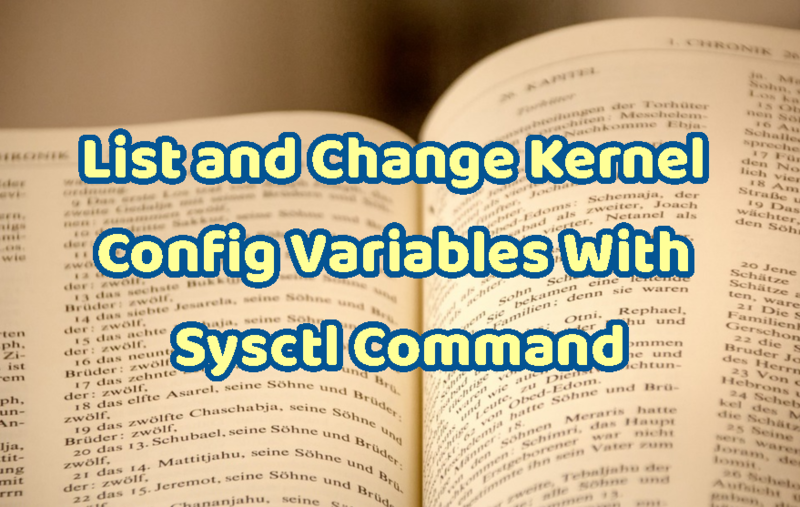 Sysctl is a tool which provides easy configuration of these kernel parameter. We will use following syntax for sysctl command. Linux Kernel configuration is stored in a file named sysctl.conf . This file is locate at /etc . Following is a sample part from this configuration file. 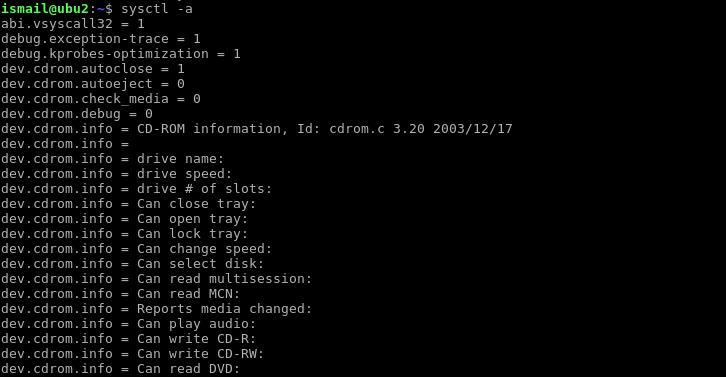 There is also a directory named sysctl.d which holds configuration files too. There are some prepared files by operating system. For example kernel hardening configurations can be put into 10-kernel-hardening.conf file for easy management. This files are generally used to make configuration persistent and effect through boots. LEARN MORE How To Use GPG To Create, List Keys and Sign Files? Previous part we have examined configuration files. These files only stores some of the kernel configuration variables. There are some default values those can not configured explicitly. Default configuration parameters can be listed with -a option which means all. there is a lot of parameters we can not list here. In previous example we listed all kernel parameters. There are a lot of kernel parameters which will fill our screen. If we just want to get a single parameter we can specify it to list. But we need the exact name of the parameter. If we do not know exact name but some part of the name we can filter it. To learn filtering look example below. Next line provide the value vm.laptop_mode currently holding. 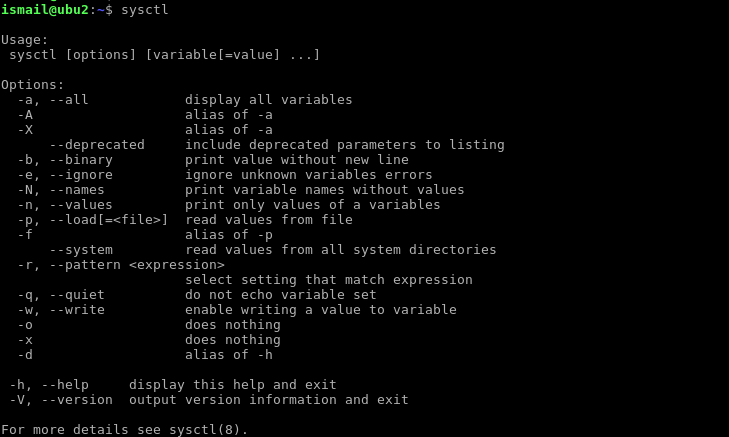 $ sudo sysctl -a | grep "laptop"
There a different type of kernel parameter categories. We will look them briefly with most popular parameters names. device category used to set connected devices information, hid, mouse click key codes, raid speeds etc. fs category is used to store file system related nfs configuration, quoata parameters etc. kernel category provides kernel related config host name, numa, pty, random entropy etc. vm category provides memory configuration like huge pages, over commit, swap, laptop mode etc. LEARN MORE How To Change Linux Hostname In Ubuntu, Debian, Mint, Kali, CentOS, RedHat? Kernel parameters can be changed from user space with sysctl. To change this parameters we need root privilege because it will effect system wide. In this example we will change the vm.laptop_mode and set it true. OR more tidy and manageable way is create a file as /etc/sysctl.d/30-laptop for this type of laptop settings and and ad to this file.